Avatars: As soon as you download the NXE, you can begin creating your avatar. There's a bunch of options to choose from. Netflix movies: If you're an Xbox Live Gold Member/Netflix subscriber, then you can stream movies from Netflix to your Xbox 360. There's a very nice selection of thousands of movies. Install games to the H/D which means no more loading from the disk and no more scratch disk errors, etc. The only two drawbacks to this is that you must keep the game dvd in the tray or else you can't load the game from the H/D and the fact that it can take up a good amount of storage. Indie games: For the first time ever, gamers can download games straight from the indie developer community and some are only 200 MS Points. New themes designed just for the NXE. 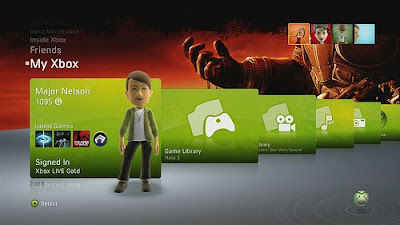 I'm overly excited about this new change Microsoft and the Xbox 360 team has made and boy has it been worth the wait! Tomorrow, the floodgates open as everyone on Xbox Live will be able to experience the New Xbox Experience for themselves!